The status of memetics as a science. Robert Aunger, Susan Blackmore, Maurice Bloch, Robert Boyd, Rosaria Conte, David L.Hull, Adam Kuper, Kevin Laland, John Odling-Smee, Henry Plotkin, Peter J. Richerson, Dan Sperber. In this instance, once again I would like to show how Boyd and Richerson misunderstand the very concept of replicator, and consequently offer a critique of memetics which is not as constructive as it could have been. Furthermore, I want to challenge Boyd and Richerson suggestion that population thinking is a better way to looking at cultural evolution. Boyd and Richerson first introduce replicators as “material objects that are faithfully copied”. It certainly isn't Richard Dawkin's view who described replicators as “any entity in the universe of which copies are made”. Indeed an “entity” is not necessarily a “material object” and by limiting their horizon of possibilities, Boyd and Richerson limit their own understanding of memetics. We will see later how this leads to confusion. Fidelity. The copying must be sufficiently accurate so that even after a long chain of copies the replicator remains almost unchanged. Fecundity. At least some varieties of the replicator must be capable of generating more than one copy of themselves. Longevity. Replicators must survive long enough to affect their own rate of replication. From reading this it appears that Boyd and Richerson didn't understand Richard Dawkin's definitions. First of all, fidelity means that replicators remain unchanged and not “almost” unchanged. A replicator that changes is not a replicator. If an instance of a replicator mutates then it is a whole new potential replicator that appears. This new replicator is instantly in competition for survival against the very replicator from which it originated. Richard's point about fidelity is that it needs to be not 100% perfect so as to allow mutations to happen, new replicators to appear, and evolution to occur by selecting the best replicators. Secondly, technically, all replicators do not need to generate more than one copy of themselves. What Richard meant to say is that the higher the fecundity the higher the chances of survival. In other words, natural selection will usually (but not always) favour higher fecundity. Finally, replicators obviously live long enough to affect their own replication rate otherwise they wouldn't replicate at all! Again, what Richard meant here is that the longer a replicator lives the more chances it has to have an opportunity to get copied. It is very unfortunate that Boyd and Richerson misrepresent Richard's ideas in such a way. Because of this misunderstanding they then criticise memetics for the wrong reasons. In this chapter we want to convince you that population thinking, not natural selection, is the key to conceptualising culture in terms of material causes. This argument is based on three well-established facts. There is persistent cultural variation among human groups. Any explanation of human behaviour must account for how this variation arises and how it is maintained. Culture is information stored in the human brain's. Every human culture contains vast amounts of information. Important components of this information are stored in human brain. Culture is derived. The psychological mechanisms that allow culture to be transmitted arose in the course of hominid evolution. Culture is not simply a by-product of intelligence and social life. They then develop each point in the following chapters. In the first Chapter Boyd and Richerson advocate the group theory of evolution. Valid points against this view of evolution have been made before and I am not going to repeat them here. All I want to say here is that however seductive and intuitive the group theory may seem it nevertheless lacks any strong theoretical model in the sense that in group theory no one knows what is being selected. I believe that group theory may be a convenient tool for studying some evolutionary patterns but gives no real explanation for how evolution occurs. Also, I don't think it will apply any better to cultural evolution than it does to biological evolution. 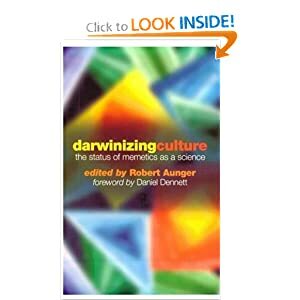 In the second chapter, Boyd and Richerson argue that the majority of culture is stored in our brains, rather than in artefacts for example. They also argue that culture is not stored in our genes, or in other words, that genes have very little role to play in the differences that we can see in different cultures. The points Boyd and Richerson make are very good I find. The only issue with this lies in the definition of culture. Indeed culture lacks a clear definition today and any attempt at studying it begs the question “what is culture?”. If we were to to transpose the idea of culture to genes, what would you call the “genetic culture”? Is it the genotype? Is it the phenotypes? Is it the living cells and bodies? Is it all of it? Or is the question irrelevant? In the third chapter, Boyd and Richerson introduce the concept of local enhancement. They explain how a mother monkey can take its baby monkey to places where the baby monkey will learn new tricks, not through looking at his mother, but through his own exploration. Therefore there is a kind of inherited behaviour linked to the habits of the parent without having children directly copying them. I find it to be a very interesting point, but unfortunately, from the replicator's perspective there is no reason to see anything cultural here. There are no replicators involved in this process, Boyd and Richerson say it themselves, but the fact that they nonetheless consider this as being cultural material is, in my view, highly doubtful. If you consider local enhancement as being able to create any “cultural material” then suddenly an awful lot of biological behaviours become cultural too. Is the fact that salmon goes back to the place where it was born cultural? Is the fact that the next generations of plants grow in the same place cultural? There is just as much local enhancement here and yet you wouldn't call this cultural. In my opinion, Boyd and Richerson are very confused about the nature of culture. They see culture where it is not, where biological processes are enough to explain the observed behaviours without needing to introduce a hypothetical culture. Boyd and Richerson go on to try and show that there can be no replicators inside our brains because there is no way to prove that the way one brain learns a behaviour is the same as the way another brain learns it. I perfectly agree with their position here and they make their point very well. The problem here is though, that they conclude that culture may not need replicators to exist. All I want to say here is that the fact that memes are not in brains does not mean that memes don't exist. I go back to my own ideas here which are that memes are actually travelling on the media that we use to communicate, and that our cultural brain structures are the phenotypes of these memes. Boyd and Richerson then go even further and attempt to give their “coup de grâce” to the meme idea. They try to show that the copying process is too weak to allow the existence of memes. For example, in the pronunciation of certain sounds, we never copy exactly the sound of our parents or others, we don't necessarily either find the average pronunciation, but we create our own version that fits best us and our environment. Therefore, according to them there is no replicator here but there is nonetheless a cultural transmission and evolution taking place. The problem of the fidelity in the copying process of memes is a big and serious issue that they do well to bring up. Dan Sperber also points the finger at this problem in his own article. A replicator may be defined as any entity in the universe of which copies are made. What is a copy ? What is the entity being copied ? That is the very reason why I offer my own definitions in my articles to try and be as precise and accurate in order to have meaningful tools to develop memetics. One of the key elements to defining a true copy is to define a reference, a point from which two entities can be compared. For this purpose I introduced the concept of reader. In my theory, the reader and the replicators are part of a necessary system, together with the environment. The concept of reader is nothing magical and is a rather simple idea which efficiently helps answering the questions of copying fidelity, and others. The concept of reader makes the concept of copy a relativistic concept instead of an absolute concept as it is usually understood. The definition of reader comes together with a better definition of the replicator. As always, comments are very welcome. WHAT IS A MEME ? WHAT IS A CODE ? 1a - Why memetics ? 1b - What is a replicator ? 2c - Copy or not copy ? Show me a meme ! Why is football so popular? Why is football (soccer) so popular?